Some films completely embody a time and place, a particular style or genre uniquely popular in that exact when and where. Others land on those transition points between eras, exhibiting qualities of both the past and the future, belonging somewhat to both but not fully to either. The film adaptation of the stage musical Fiddler on the Roof, released in 1971, falls into that latter category. More after the jump. Fiddler on the Roof was one of the last great MGM musicals belonging to the classic movie musical tradition of which MGM was the undisputed king. The genre would veer course in the ‘70s, ‘80s, ‘90s and ‘00s, adding more and more realistic elements and losing that spontaneous breaking into song that otherwise interrupts the narrative, culminating in the total integration of a film such as Chicago. But Fiddler also exhibits a gritty realism, not yet of the level that would eventually be achieved in the mid- to late-1970s, but definitely a precursor of such. Shot on location in 2.35:1, the film also shares some qualities with the epics of the 1960s, although not epic in scope itself. For more, hit the jump to check out my review of the 40th Anniversary Edition Blu-ray. 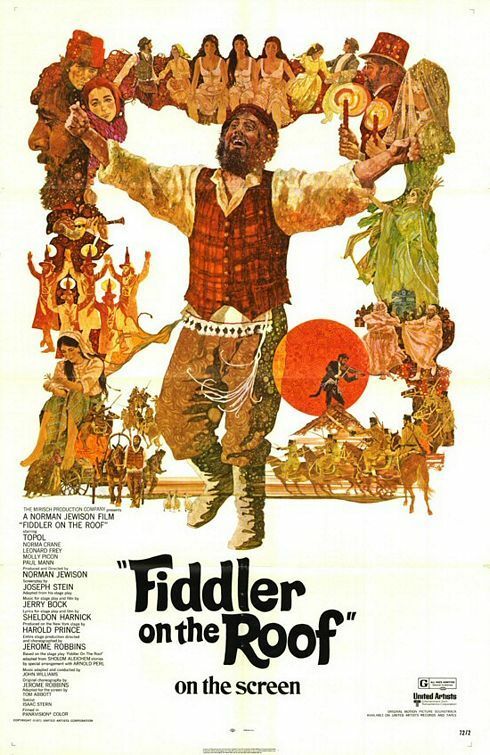 Fiddler follows Tevye (Topol), a poor Jewish milkman living in Czarist Russia shortly before the Russian Revolution as he struggles to maintain his religious and societal traditions in the face of a changing world. This battle is manifested in the marrying off of his three eldest daughters. The first such conflict arises in regards to arranged marriages. 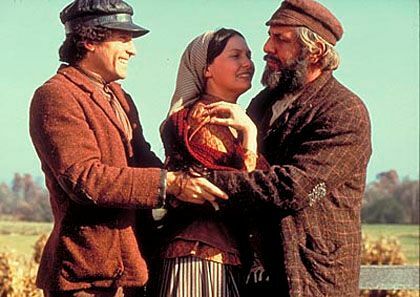 Following tradition, Tevye arranges a marriage for his daughter Tzeitel (Rosalind Harris). But she and her childhood friend Motel (Leonard Frey) have pledged themselves to each other. In the opening scene Tevye describes the lives of the people in his town as precarious as the perch of a fiddler on a roof. The titular fiddler appears periodically throughout the film, a man bringing (and representing) joy in the face of all that is happening around them. 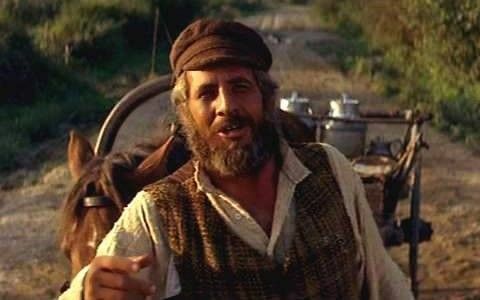 In the very final scene, the fiddler follows Tevye and his family on their exodus out of town, a symbol of hope for the new life to come. Fiddler on the Roof runs three hours, and the first hour definitely felt long (not an anomaly among musicals of the time). Although I appreciated the acting (particularly the charming performance of Todol) and production values throughout, I had a hard time getting into the film during that first third. I was very conscious of the previously described incongruity of styles. The pace picks up, however, in the second hour, and I was fully engrossed in the movie the rest of the way. MGM has done a fine job restoring the film—for the most part. In just one scene, about two hours into the film, dust and particles of the sort one would expect at the beginning of a reel litter the screen. Considering that the picture is otherwise pristine throughout, this was a rather shocking—and disappointing—oversight that could have easily been fixed. Similarly, audio is largely crisp and clear, but in a handful of places the quality suddenly drops—for example, one scene had a cavernous sound to it, as if the original recording microphones were nowhere near the actors, something one would expect from a low-budget indie film. Bonus features… well, once you work around MGM’s ridiculous new menu philosophy and can actually find them… I had yet to experience the studio’s recent run of Blu-Ray releases without a proper main menu, with special features only accessible via the Popup Menu button. Really? Are you kidding me? How cheap can you be? After spending all that money on a beautiful restoration (minus the aforementioned oversights, which I assume were accidental), why skimp on that most basic of elements, a main menu? I initially thought my disc was defective. As for the extras themselves… the disc contains the usual litany of featurettes on the production, principal cast and crew, audio commentary, etc. Great stuff for fans of the film, they vary in interest level for the casual viewer since they are the fairly “typical” extras we have come to expect. Most intriguing are those bonus features that have survived the last forty years before the studios saved everything for DVD/Blu-Ray special features. These include a nearly 50-minute vintage featurette “Norman Jewison Filmmaker” about the challenges of foreign country on-location filming; a cut song, “Any Day Now” set to stills and clips; and a side-by-side comparison of the final de-saturated Tevye dream sequence and the original full color version. 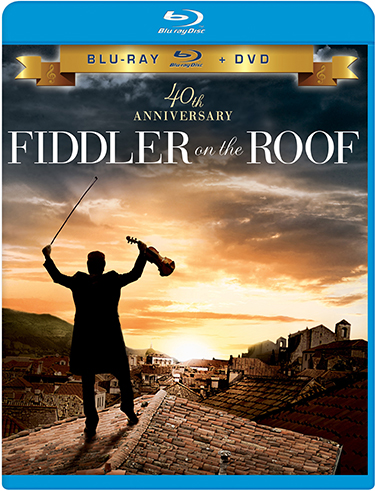 A multiple Oscar-winner, Fiddler on the Roof does remain a classic. Overall, the 40th Anniversary Blu-Ray stands up as a high-quality release, although there are a few areas in which it sadly falls short.